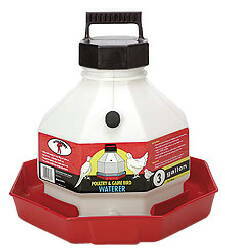 This 3-Gallon Fount for poultry or game birds is rust-proof, dent-proof and easy to fill. Vacuum-sealed cap creates an automatic water flow. Rugged handle allows easy transport even when full. The durable translucent polyethylene jar snaps neatly and securely onto the red polystyrene base. 4.5 lb.